The Commandant of the United States Coast Guard has a lot on his plate: Enacting the USCG strategy in the Arctic; Helping to stem illegal drug flows; Thwarting the growing cyber security threat; Working to ensure Rights of Navigation in several global hot spots … the list goes on. But when talk turns to his top priority, Admiral Paul Zukunft does not hesitate to name ‘people’ as one of his highest priorities … more succinctly, the attraction and retention of an increasingly diverse, intelligent and skilled workforce to drive the United States Coast Guard through the next generation. If you talk about the U.S. Coast Guard, talk can quickly turn to ‘stuff,’ as USCG commandeers fleets of maritime and aerial assets employed to keep U.S. waterways safe, navigable and secure. A big part of Admiral Zukunft’s job is ensuring that the U.S. Coast Guard is adequately funded and directed to acquire the systems and products needed to accomplish myriad missions for the coming generation. In this regard, Admiral Zukunft professes optimism, pointing out that the Coast Guard acquisition budget in 2016 doubled: the best acquisition budget ever for the nation’s fifth, uniformed military service. While the level of talent entering the Coast Guard is at an all-time high, Admiral Zukunft maintains that real success comes in not simply finding good people, but keeping them; a trick made increasingly difficult when the private industry companies come calling. That is the conundrum: getting that same level of commitment, that sense of belonging that isn’t as much about a paycheck as it is about that commitment; that sense of accomplishment that you can only get by serving in the Coast Guard. 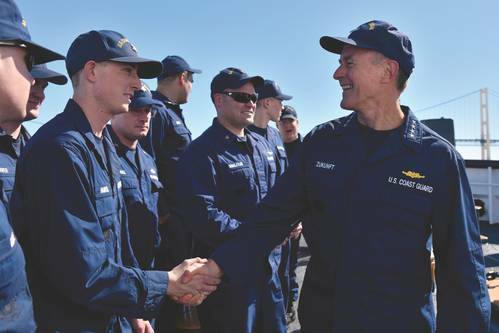 “Because I can’t get in a bidding war with mid-grade, enlisted members against the private sector that may double or triple what someone may make in today’s Coast Guard,” said Admiral Zukunft. That reward is geographic stability.